Alright folks, as you might remember from my post, "Yessir, we got ourselves a real band! ", my new project is called "Shane Hickey and his Magical Ukulele.... and Jerry". Well, to really sell a name like that, my ukulele better be pretty freaking awesome. Also, I'm going to need something that will take the focus off of my playing. Cause otherwise folks might wonder why they just shelled out $3 to see a couple of hacks. Heh. Well, as luck would have it, I found a fella who makes magical instruments. 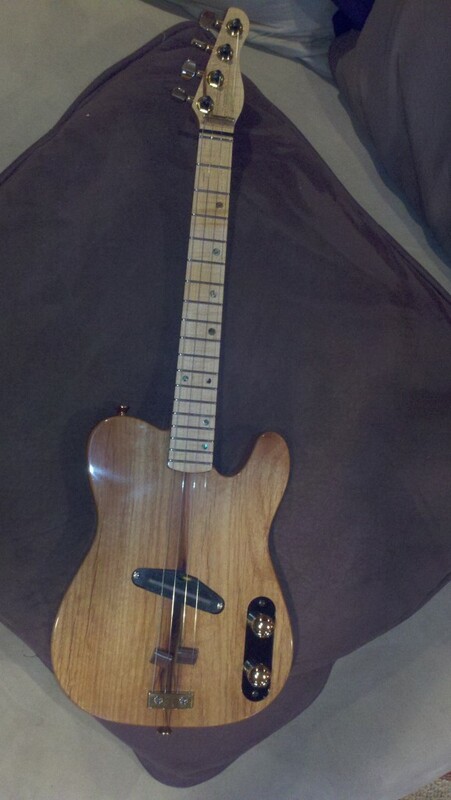 There is a local luthier named Ryan Rukavina and he does some pretty magical work. I got wind that he was making a couple of Teleukes (Solid body electric ukuleles patterned after the Fender Telecaster. When I heard about them, I asked him to keep me up to date on the projects because I was probably interested. By "probably interested" of course I mean, insanely interested. So, I was pretty much on cloud nine yesterday when I dropped by Ryan's shop to pick up my new Teleukulele! I will post some videos very soon so you can hear how great it sounds but, until then, you can feast your eyes on this baby. Here's more good news. 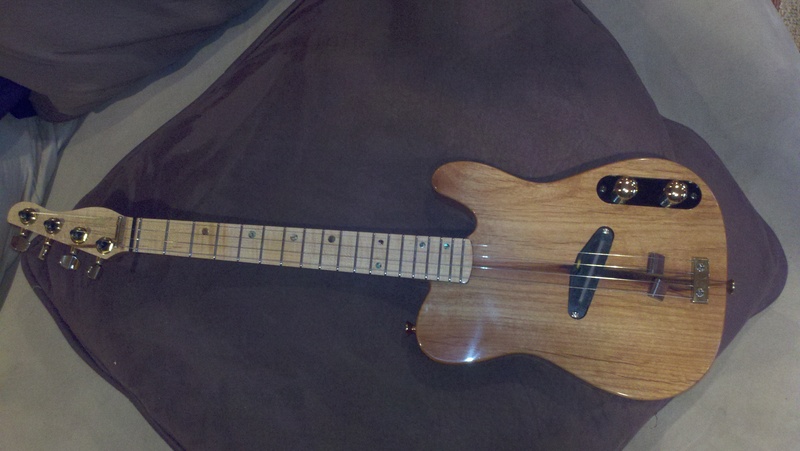 If you are looking for your own custom electric ukulele, then look no further. Ryan also made a brunette to the blonde that I purchased. Check out the eBay auctions below and you will see it listed with some more of his creations. 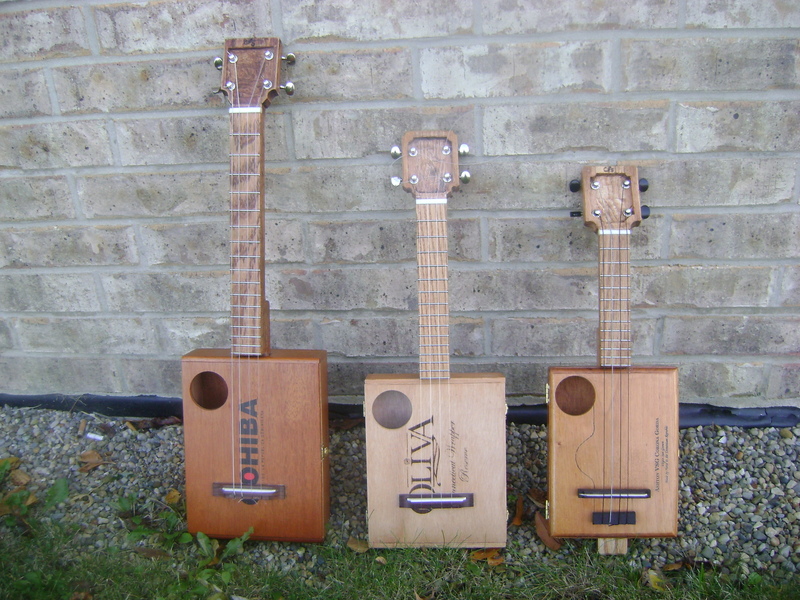 Editor's Note: So, on Twitter I was contacted by a friend who's husband makes Cigar Box Ukuleles and, let me tell you, he takes it pretty seriously. After seeing some of his Cigar Box Ukuleles (or CBUs, as he often calls them), I asked him to write a guest post and he happily obliged me. You should also know that he makes custom cigar box ukuleles (and mandolins, dulcimers, guitars, etc) and he's currently taking orders. I'm also trying to convince him to sell some on ebay. But, for the time being, if you want one, you should contact him at "cornfed-groove at hotmail.com". (Just replace the " at " with the @ symbol. I didn't want his e-mail to get harvested by spammer robots or something). NOTE: Jon is working on a website as well at www.cornfedgrooves.com. Now, I wanna take a few minutes to talk to you about cbu's...that is cigar box ukuleles. Cbu's are the bomb! Not only can you have a great sounding instrument, but you can have a really cool, off-the-beaten-path piece of rustic American culture. Take all the glory of Hawaii in one hand, the historic wonderment of American music in the other, then put your hands together...you'll find that what is born is the raw, screaming beauty of brand new cigar box ukulele. I own a lot of nice instruments... acoustic guitar, electric guitar, mandolin, banjo, ukulele, mountain dulcimer, strumstick, congas, bongos, djembe, harmonicas, and Irish whistle. The point is that despite all these great instruments, and except for my guitar (which I get paid for), I never play them. Anyway, there is something really tasty about the old-skool flavor of a quality homemade instrument. Although they aren't professionally manufactured, if made well, they can be comparable to a good manufactured ukulele in both volume and tone. I've made a lot of cigar box instruments: ukuleles, mandolins, stick dulcimers, 3 and 4 string guitars (some with magnetic pickups), even a one string cigar box diddly bow...but the ukulele is my favorite. Everyone has a different style or twist, from the hack hobbyist to the aspiring luthier, and although some are better than others, you have to appreciate people's love of music. A lot of people buy old ukes, using the tuners, bridge and various parts while bolting the neck onto the box...this is a great way to start. Yet with basic tools, a little money, and some extra effort, you can make everything except the box. Myself for instance, I craft the entire neck, headstock, make my own fretted fingerboard, electronics, etc. There are a lot of variables in building, and because of that, like traditional ukes, cbu's range in price and quality. It is my opinion that everyone should own a cigar box instrument whether they make it or purchase it from a craftsman. Cbu's can be great instruments with unique style. They make amazing conversation pieces and if you got the guts, I imagine they'll always love you at the local Cracker Barrel! If anyone is interested, I am always taking orders on ukuleles and other instruments. I also teach classes on how to do make them, and I am even willing to travel! Being laid off for 9 months has afforded me the opportunity to travel to scratch a few dimes together. I offer this class for free to whomever can host and provide a few paying students. You can contact me for further details.